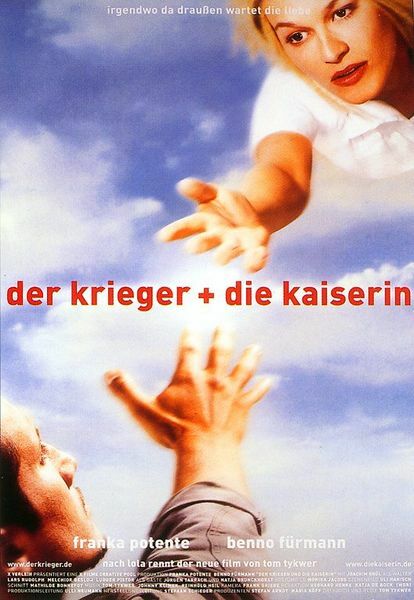 Der Krieger und die Kaiserin (The Princess and the Warrior) is Tom Tykwer's second outing after Lola Rennt (Run, Lola, Run). (Tykwer retains Franka Potente as his leading lady.) While Run, Lola, Run is fast and frenetic, this movie is slow and somber. Franka Potente plays Sissi, a psychiatric ward nurse, while Benno Furmann plays Bodo, an ex-soldier who can't hold down a steady job. They meet in the most unusual of circumstances - under a truck. Bodo was running from the cops, and caused a truck to hit Sissi. Bodo, still evading the police, hides under the truck and finds Sissi there, unable to breathe. Not knowing that he is the cause of the accident, Bodo performs emergency tracheotomy on Sissi using a pen knife and a drinking straw. After she has recovered, Sissi goes looking for her saviour. She ultimately finds him, but he wants nothing to do with any woman after losing his wife in a gas station explosion. Bodo and his security guard brother pulls a bank heist, and Sissi happens to be there (again). The robbery goes wrong, and Bodo's brother is shot. His last words to Bodo were, "Get off the toilet, Bodo." Sissi hides Bodo in the mental institution as a new patient. Meanwhile, another patient tips off the police. Cornered on the roof, Sissi and Bodo jumps and lands on a moss-covered pool below. They make their escape to her friend's place in the countryside. Along the way, they pass by the gas station where Bodo's wife committed suicide. Bodo makes peace with himself and lives happily ever after with Sissi, fulfilling her dream in which they were "brother and sister, mother and father, husband and wife". Actually, that last part is my own interpretation. The movie with its many subplots is much more complex and deeper than that, so its up to the audience to make his/her own conclusions. Lee is fresh out of the mental hospital. She completes a typing course and gets a job with E. Edward Grey as secretary. Mr. Grey finds a typo on her letter and marks it with one of his dozens of red markers. He calls her to his office and "punishes" her. Funny enough, Lee discovers that she liked the "punishment." She even goes out of her way to make deliberate mistakes, so she can get more. Things were okay for a while - Mr. Grey is able to release his sadistic tension and Lee feels empowered with the nitpicking Mr. Grey is giving her. One day, Mr. Grey probably figured this office romance is going to work out, so he starts giving her the cold treatment. Lee makes more and more obvious mistakes, but he just ignores her. He later fires her for good. On her wedding day to an old high school acquaintance, she runs away and declares her love to Mr. Grey. After days of sitting on Mr. Grey's chair with her hands on the table, with no food or drink or toilet breaks, she proves herself as a loyal submissive. Mr. Grey comes back and takes her as his bride. No wonder Ten shares are falling like a brick in a vacuum - something like 14% in two weeks. Big Brother has always been Ten's trump card in the ratings war. It used to be naughty, but this season is downright dirty. If it's intention is to get attention, it got it all right. Even the media watchdogs have taken notice, and they're taking a closer look. The market didn't like what it saw, so down you go. A description of Big Brother Uncut: "The naughtiest, skimpiest, downright dirtiest bits of Big Brother that we can't show you any earlier. See what your favourite housemates are REALLY up to in the Big Brother House." And this for Big Brother Up-Late: "Take a live and uncut peek into the late night mischief and more controversial goings on in the Big Brother house. Under cover of night no-one is safe from the cameras in the Big Brother House." But that's not all, Ten gives us Blokesworld: "Twenty Six minutes of feel good light entertainment which traverses the world of "Blokedom" and rediscovers the joys of a roaring V 8 engine, a good bar-BÂQ, a punt on the dogs and a bit of a perve along the way. Plus handy hints on how a bloke can re-immerse himself into a culture more reminiscent of the sporting 70Âs than the snag infested 90Âs." Never watched BB05, but caught Blokesworld one time. You have a bunch of unshaven blokes sitting around, VB in hand, with a sprinkle of scantily-clad dancing ladies, who don't mind a little flashing. Segments include a barbie-building competition, a pole-dancing competition, some Crusty Demons videos, lingerie pillow fights, Chinese martial arts demonstration, etc. If things were allowed to run their natural course, I'm sure the share price of Ten would've gone through the roof. Too bad this is not an ideal world. 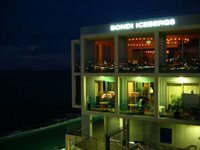 Spent the whole day at Bondi Icebergs. Would've been great if not for the fact that I was there for a company planning session. That means a whole day of PowerPoint presentations. The only time I got to look out at Bondi Beach from the balcony was during coffee/tea breaks and lunch. Bondi Icebergs was not as swanky as I thought. Either that or we're in the wrong conference room. I was told this is where industry captains wind down after a long hard day of doing nothing. Well, the conference room we're in has a very noisy ventilation system. Parts of the carpet were worn-out, there's a disco ball hanging on one side of the room, and the food was delivered late. 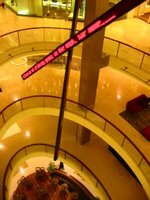 Skipped dinner at The Rocks, and went straight to Westfield Bondi Junction. It's one of the few places in the city that closes late, but that's enough to entice late-night shoppers. I was there 6:30pm, and there's not much shoppers around. Dropped by the digital camera section of Harvey Norman. Was surprised to see the Canon PowerShot S2 IS there. The guy at the counter says it was only delivered yesterday. He proceeded to show me the features on the model, plus comparisons with the Pro1, the G6, and the Sony Cyber-shot DSC-H1. By the time I left the shop, I'm all confused. There's a reason why driving instructors charge A$35 to A$50 per hour, and they can still make good money. It's always nice to know that some people share your eclectic TV show choices. Lunch at Doyle's Sydney Fish Market is a good way to spend three hours of your Thursday afternoon. Listening to people chat about their lives is not a good way to spend five hours of your Sunday night. That mint collection of Happy Meal Snoopies will be worth a fortune in the future. The lady who took my money said so. Why do people come to my blogsite for beautifulagony passwords and pythonchallenge hints? Those BSL shares are not a loss and those COH shares are not a gain until they are sold. A bargain's not a bargain unless it's a free TV or a half-dollar mobile phone. Trust not the know-it-all. Trust not the experts. Trust not the guesser. Trust no one. Apple IPS works best with a high-power USB 2.0 port. Or so I was told. Now I know. Monday night is SBS night. That's why I make it a point to come home early (relatively). 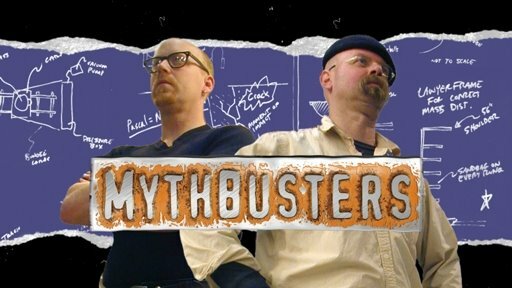 At 7:30pm, it's Mythbusters. The dynamic duo of Adam and Jamie makes science and engineering so much fun. Makes me wish I had them as my lab instructors. Basically, they go around disproving (or proving) urban myths that we've all heard before by doing actual experiments. For example, do you get wetter running or walking in the rain? Can chatting on a cell phone while pumping gas cause the pump to blow up? Is it really that dangerous to answer the call of nature on the electrified third rail of a train track? Did Lucille Ball exposed a Japanese spy ring by listening to radio signals transmitted by her tooth fillings? Can firing a bullet inside an airplane cause an explosive decompression? Can the rhythm of soldiers marching together can cause a bridge to collapse? Can you really murder someone by dropping an electrical appliance into a bathtub? Is it possible to throw a regular playing card fast enough to inflict bodily harm? These and more on the Mythbusters. Next up are Pauly, Habib, Toula, and Rocky in Fat Pizza. I've watched these guys circle the globe (twice) in search of the original pizza. Now, they're back with an all-new series. How did I know it's really new? Well, Pauly's mobile phone has the latest Crazy Frog ringtone everyone's crazy about. Bobo the Chef is expanding his pizza business, so he opens an outlet at Hashfield Heights. He gets an apprentice, hires a bunch of misfits (a parking lot DJ, a Chinese, and a Maori Bouncer), and makes Pauly the supervisor. He refuses to rehire Davo, who's living in a trailer in his G-string, stoned as ever. The episodes revolve mostly around fat pizzas, fast cars, cultural clashes, and hot chicks. Fully sik, mate! At 9pm, it's John Safran vs. God, where he takes on the world's major religions. 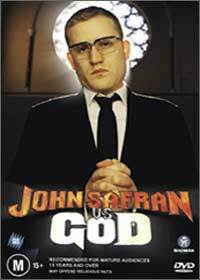 If you think he's good in Music Jamboree, he's a natural in John Safran vs. God. He has so much angst inside him. Why take it out on the boybands and the music industry, when you can take it out on religion? In this irreverent, blasphemous series, he gets a fatwa placed on Rove McManus, tries to convince the Grand Dragon of KKK to admit him as a member, auditions for the Harlem Gospel Choir, gets a Mozambique witch doctor to break the 30-year old curse placed on the Australian football team, buys himself a set of Mormon magical underpants, drinks Viking wine filtered through the priestess' underwear, etc. Ah, the things people do for TV ratings. Even the presence Heather Graham and Marisa Tomei can't save this movie. Has a good enough plot, but story development is just bad. Macarena dancer from India goes to New York in search of the American Dream. He works his way up as a waiter, a pr0n star, a party swami, then to guru of s3x. He preaches to the rich and famous, but actually gets his teachings from his movie partner (Heather Graham). She later discovers his scam, and decides to tie the knot with her long-time fireman-fiance. At the wedding ceremony, the guru intervenes and wins her back. Meanwhile, the groom "comes out" and declares his love for his fireman buddy. Everybody breaks into a Bollywood-style dancing, and get this, Heather and Mister Guru flies off into the heavens in a red Mercedes convertible. I kid you not. I have this knack for identifying bad movies just by looking at the title and reading the back cover of the DVD. And I was right about this one. Throw in storylines and scenes from all the family dramas you've seen, and you end up with this. Surprise wedding by the sea with all family members present, happy and content. The script is flimsy, the dialogue is bland, the scenes are mostly irrelevant. Heck, I wasn't even watching the movie. But working away on my laptop, while listening to the dialogue and looking at the TV once every few minutes, I still have the feeling I've been cheated. Throughout the movie, I kept asking is this scene even remotely relevant to the plot? Then I go, Jeez, what plot?! I can go on and on and on, but I'll make this short - this movie is bad, bad, bad. My guess the reason why this movie became a box-office hit is the same reason why Yao Ming was voted as the starting center for the NBA All-Stars. 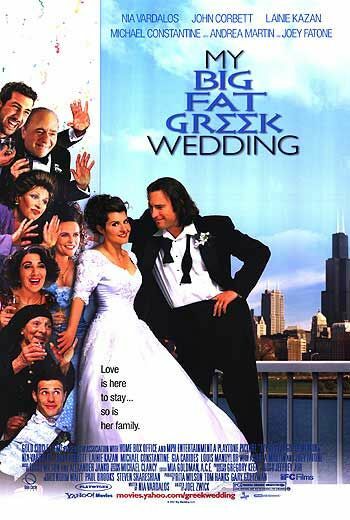 Billions of Chinese voted for Yao Ming and millions of Greeks watched My Big Fat Greek Wedding. Here's the plot. Long-haired vegetarian schoolteacher marries Greek spinster. That's it. Full stop. Period. Um, I'm trying to make the plot look longer, but that's the best I can do. Some of the Greek trivia were interesting when I first watched the movie a few years ago. When a Greek girl becomes 30, you need the father's permission to date her. So, that's how a grown-up man gets baptized at the Greek Orthodox Church. Yuck, they actually spit on the bride. Oh, that's the zorba dance. They sure eat a lot, and instead of Wazzzup? they shout Oopah! every 5 minutes. On second viewing, I found the actors' performances contrived and forced. The jokes and gags are not that funny. If it's Greek trivia you want, look it up on the Internet or better yet, talk to your Greek friend. Another round of Secondhand Saturday. This time at Leichhardt. There are good things to be had in these sales. A pack of stamps for just $1. At the tourist shop in Circular Quay, it sells for $10. Bought some phone cards for my collection, too. A hardbound book of Asimov's Foundation Trilogy, including The Stars Like Dust, The Naked Sun, and I, Robot for $2. Another hardbound book of George Orwell's works also for $2. Snagged some Happy Meal Sesame Street and Winnie the Pooh characters, a Russ Cromwell Bear and a Wild Republic orangutan. I also got a Beanie Babies moose, but only for 5 minutes. As I was driving away, the lady owner flagged me down and wanted it back. Said she couldn't bear to part with it. I should've doubled the price. On my way to the post office, I passed by this lady's place, and the front of her house is being mobbed by lorakeets. I've never seen so many lorakeets in my life. I asked her if they are her pets. No, she said, they just come to her for food. They come in the morning, and again in the afternoon. She has been feeding them every single day for the past seven years. She even has a special tree/twig where she sticks apples, pears, bananas and grapes for them. Some of the pigeons try to gatecrash and get a free lunch, so she has to chase them away. The lorakeets are so colorful and radiant, I wonder if they wash their feathers every day. They twitter non-stop, and because of their numbers, the sounds they make are quite loud. I wonder if the neighbors ever complain.